The second season or wave of conferences and trade shows is approaching quickly and will start immediately after we return from our summer vacations. Some of my clients have expressed frustration about not only managing their plan for conferences – but where to even begin. Which conferences should we attend? Do we participate as attendees or do we sponsor? Do we purchase a booth in the exhibit hall? Who will manage our booth? What amount of money is reasonable to spend? Should we just register and participate as attendees, and is this a smart option to consider? There are many questions and scenarios to consider and answer before you even agree to participate. A little planning will help streamline the entire process so you use your time wisely. Here are some recommendations and processes for not only how to determine which conferences and trade shows you should participate in, but also how to plan for them before, during and after (you will see that the “after” is the most important). This information is not intended to be all-inclusive and can be modified based on new information learned, experiences gained and goals revealed. Audience. Will this attract a large number of people from your target audience (“ideal client”)? Participants. How many participants usually attend – and of those, how many are fellow sponsors vs. true attendees? Location, location, location. Is the event city and venue part of the draw and attractive to attendees? Cost. How much does it cost to sponsor? To exhibit? Is an exhibit opportunity included in the sponsorship? What’s included? Will you be able to receive a pre-conference and post-conference attendee list (with email addresses) as part of your sponsorship? Will the host organization let you customize your sponsorship? Will they work with you to create a sponsorship that is beneficial for both you and the conference? Reputation. Is this an annual conference; if so, how long since it was established? Do they provide references and historical information? Do you know someone who has participated in the past? What was their experience? Speaking slots. Are speaking opportunities available? Competition. Will your competitors be there? Rationale. Why are you considering attending/participating? Is it because you have before, but are not quite sure if it’s been fruitful? Preparation. Are you and your staff prepared to complete the legwork before, during and after the conference? Be honest: If you cannot answer yes, there are other matters to address first. Do you have a process in place to track expenses, time and follow-up activities? Decision-making. Are you willing to have a group discussion and a group vote among stakeholders to attend? Participants. Who will attend? More on this later. So, you’ve done your due diligence and decided to sponsor, exhibit at and participate in a conference. If your sponsorship includes a pre-conference attendee list and the organizers allow you to contact those attendees, peruse the list for current clients and contacts. Send an email letting them know you will be participating. If you will have a booth, be sure to include the booth number and encourage your clients and contacts to stop by to see you. Next, review the list for your target and prospective clients. Ideally, the list shows an abundance of targets and prospects, which is one of the key reasons you are participating. Are there companies on the attendee list that are also in your marketing/business development plan? “Pull” these contacts and share this list with your booth personnel! (Note: Keep it manageable and limit your focus to three to five prospects.) Schedule a team meeting and update everyone about where you are in the relationship to your targets and sales cycle. Provide LinkedIn profiles of target attendees to your team. Issue an “all-points bulletin” to have everyone keep an eye out for your targets while speaking with booth visitors. Look into securing a lead retrieval device (either a pre-conference purchase or other arrangement), which will assist you and your team when greeting visitors who stop by your booth. Know “who wants to meet whom,” and keep this in mind whenever a target visits your booth. Be prepared to make introductions, and practice beforehand. You’ll also want to define the goals and objectives for attending and exhibiting at a conference. Are you looking to announce and highlight a new product or service? Are you simply just trying to accomplish brand and name recognition? Do you need to focus on gaining new connections or finding ways to break into new markets? Knowing your end game and goals will help keep your activities focused. In other words, your goal should not be to land the dream client and never have to market again. Keep your expectations real — but don’t get lazy, either. Training Opportunity: What is your firm’s spiel and does everyone know it? Are they comfortable reciting it naturally and in their own way? Practice. Depending on the size of the conference, as well as budget, target market and goals, consider hosting a smaller, intimate reception or dinner for high-priority targets and clients. These work best when held outside the conference/expo hours. While at the reception or dinner, focus only on being a connector. Look for networking opportunities and facilitate introductions with two clients who may mutually benefit from a business relationship. Doing so will reap rewards many months beyond the event. I promise! Are their personalities conducive to this type of environment? Do they have a high degree of knowledge of your services and the firm? Do they have sufficient knowledge of the conference industry and the potential targets in attendance? Are they willing to create specific personal goals for attending the conference? Do they understand their accountability for follow-up? Each booth attendee will need a specific role. Determine roles before attending the conference/trade show. You want to avoid giving the wrong person the wrong role. When you get a business card from a booth visitor, write notes on the back to remind you what you discussed, promised and would deliver. Be sure to note whom you need to introduce them to (and who needs to follow up with the specific contact). If possible, write your notes as soon as the prospect walks away from the booth. Many lead retrieval systems also allow you to document notes and qualify the lead. Complete all CRM data entry and notes about each lead/prospect on site while the details are fresh in your mind. There are always breaks in booth traffic to accomplish this. Training Opportunity: Coach booth staff in how to ask qualifying questions. Do not sell! Your sole purpose is to present yourself and your company as one that a prospective client wants to do business with. Focus on connecting at a human level and not a product level – that will come later. Instead, educate your booth visitors. Teach them something new so they feel that stopping by was worth their time. Possible activities to attract more booth traffic could include a “Deck of Cards” activity. This one involves distributing a portion of a poker or gin hand before the conference. Visitors must come by the booth to complete their hand, and win a prize. Leads. Were leads generated? If so, you’ll want to rate them: A – hot, B – warm and C – cold. Attendance. How many people attended the conference, and how many came by your booth? Conference/exhibit hall. Was it well-organized? If you didn’t think so, it’s likely the attendees felt similarly. Did the conference organizers do a good job of driving traffic to the exhibit hall? Next year. You have an important decision to make at this point — should you participate again next year? Why — or why not? Leads. Establish and implement a lead-handling/follow-up system (who is assigned a specific lead and why), set timelines for follow-up, use a computerized database for tracking (CRM system), make sales representatives accountable (recalls/reminders in Outlook calendar) for leads given to them, and then measure all results. Again, separate leads into an A (hot) – B (warm) – C (just a “thank you” follow-up – do not put in the pipeline). Communications and follow-up. Send an email to all booth visitors, thanking them for stopping by your booth. In addition to the follow-up email, send handwritten notes to hot leads. Here, the information you wrote on the back of their business cards will come in handy. Making references to any conversation you had with the lead will add another personal touch to your handwritten note. Arrange for a future meeting (e.g., coffee, lunch, office visit, happy hour). ROI. Report and record all Returns on Investment (ROI). ROI can be “soft” or “hard.” “Soft ROI” can be an introduction. For example, you met a stakeholder who could open the door to a potential client, or you learned about an industry group or association that your firm should be involved with, and then landed a speaking gig. Even meeting a prospect that resulted in getting a meeting scheduled is considered “Soft ROI.” Of course, “Hard ROI” is more evident and quantifiable, like gaining a new client as a direct result of having attended the conference. You’ll want to designate someone to track all conference notes, details, costs and ROI via a shared spreadsheet or CRM system. This same person will facilitate the pre- and post-conference meetings. 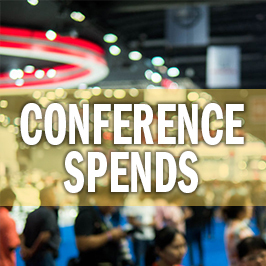 A key point to remember: If you want quantifiable results from conference attendance and sponsorship, you’ll need to spend more time afterward than you did before and during the conference. Your plan doesn’t end when the conference does. In fact, it is just beginning. If you completed your due diligence and stuck with your game-plan, your post-conference activities should keep you occupied and so busy that you may not need to attend another conference for the rest of the season! How’s that for saving money and time? Need guidance on how to handle conference sponsorships? Contact Glennie Green at ggreen@jafferpr.com.